How do jailhouse mod compare with zealios? Quite different overall, a slightly similar bump. Jailhouse mod makes the stem longer, so that the tactile legs are already engaging the leaf when at the top. This means the bump is at the very top of the keypress. IMO, jailhouse feels like a cherry clear bump with a very short travel. In a clear, the spring (if stock) gets heavy after the bump. In jailhouse, the switch bottoms out at this point. They feel weird without light springs though. So if you don’t like the mod, make sure to try out lighter springs. Well, i have them in a board since yesterday with 55g catweewe springs on unlubed mx blues, because i want to break’em in first and the board supports switchtop removal. I have problems on stabilized keys and even the normal keys feel not responsive/snappy enough, will probably change to 68g springs. I have an jailhoused aristotle in a panda housing in the spacebar and it feels great but since the bumb is right at the top, when completely seat the spacebar down all the way i am post/bump and i just get the rounded downfall. I know what you mean. That’s just the nature of the Cherry blue leaf. The nub on it catches harder on the way back up than the leaf on Gaterons. That’s why a went with Gaterons. They allow you to use a lighter spring. 3D Printed Jailhouse spacer I designed in CAD and printed by @MehAdviceGuy! Cool work. How much would a set for 60% cost to print? Hey, @evangs. Do you plan to restock j-spacers at some point? Also, while we’re at it, I don’t suppose you know of a secret stash of Retro60 cases that aren’t purple heart?? Wondering what are the differences between j spacers and just a regular old o-ring? How does it affect keyfeel/sound? You dont want soft rubber rings If you bottom out a lot. Sizeing is difficult. Too big and you jam your Switch, to small and its still clicky. I see, thanks for the input! 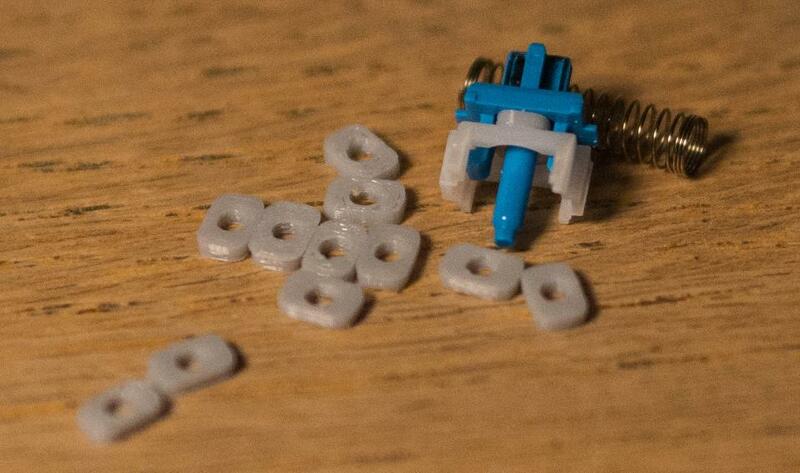 I think I’ll probably just go with either the j-spacers or 3d printed ones.